I was wondering how it is possible to use the Top Shot Elite Lightgun for aiming in the game like in the early videos. I just bought the XBox 360 version with a windows receiver. So I still haven#t got a Head Mounted Display and so I have to use the screen. I wanted to play Counterstrike with the pedals of my Steering wheels for walking and the Lightgun for aiming. JoytoKey founds the Gun but not the Trigger and the Pump-Action buttons which are the most important ones and unfortunatelly no movement by the gun. Activision and windows don't know what to do, cause they never palnned that people would use their products this way. Could anybody give me some advice, please ? Update: I managed to activate the trigger and pum-action by "Options" -> "Show/Hide Buttons" klicking on "Show all Axes "8way + Pov x 2"
Now I have to wait for the Rift and the Omni. If someone knows how to activate the aiming with the top shot elite or other lightguns for PC, please still leave a comment. Hi @Zash, welcome to the forum. Sorry I've never used it with the sensor bar. A bit of googling though and two known issues coming up are 'ensure your setting matches bar position above or below TV'. Also, 'TV size may affect how far away you need to stand during calibration'. Good luck. I tried this many times and in every arrangement without any success but I have another idea already which is a bit inconvenient but I think it will work. So give me a couple of days. Here I am back with bad news. 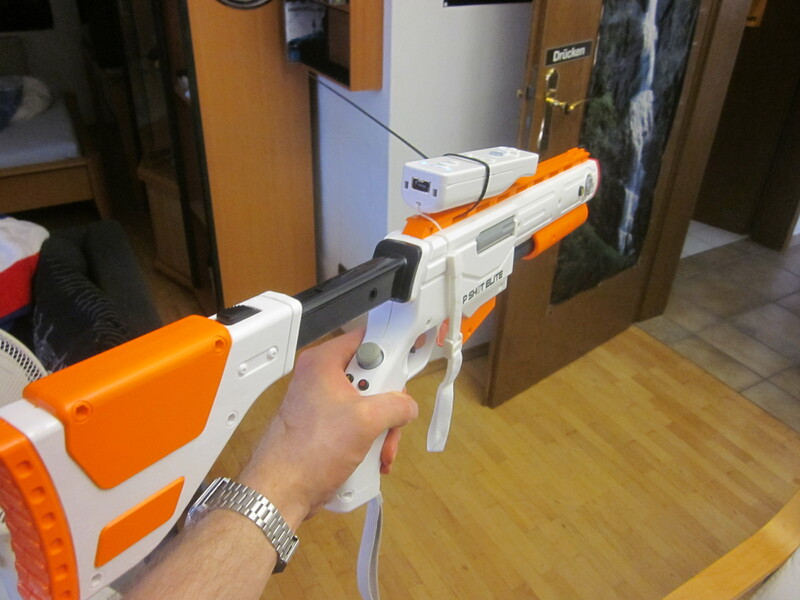 My plan was to use a wii mote as a mouse device and combine it with the top shot elite like on the picute below. I spend several hours, but I didn't succeed. there are plenty videos on youtube and forumposts. I tried several sensor bars and softwaretools but my cursor which can be controlled by the wiimote alsways hangs on top of the screen and only can be moved on the side by turning the device, not moving it. But I'm sure that this would work for you, if you can setup the wiimote as your moursecursor. have you tried using http://onakasuita.org/wii/index-e.html ? i found this posted somewhere on this forum before.